NEW TECHNOLOGY. Google Expedition Sets for Classrooms. FIELD TRIPS. Planning on extra field trips. NEW EQUIPMENT. Yoga mats for an added after school exercise program. ENRICHMENT PROGRAMS like Miner of the Trimester, 6th Grade Egyptian Experience, Coding Workshops & Digging for Excellence. CLASSROOM SUPPLIES. We love to give our teachers a little something extra so they can make their classes and rooms extra special for your student. STAFF APPRECIATION WEEK. Our staff and teachers are amazing and we like to show them how much they mean to us by treating them to lunch and a week of special surprises. COMMUNITY EVENTS. Your PTA supports not only projects and student enrichment, but social events focused on bringing our students and families together in community. 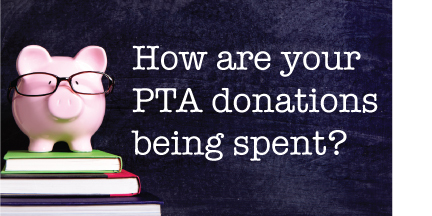 If you would like to see a complete budget report, just email us at silveradomiddleschoolpta@gmail.com.